I’m not a huge fan of panettone but there is often one knocking around after Christmas and it does make a delicious cheat’s bread-and-butter pudding. This one came from the bottom box of a ‘Tower of Treats’ and was re-gifted to me in January. I was thrilled because I new exactly what to do with it. Since there is fruit, mixed peel, butter and sugar already in the panettone you don’t need to add any extra – which is why I use the word ‘cheat’. If you have a particularly sweet tooth you can add some extra sugar to the custard if you like and I do add a light smear of extra butter to the top of each slice of panettone for a nice crispy crust. It’s the perfect comfort food but very indulgent. Carbs, sugar, fat – it’s all in there. Sorry if you’re trying to be good. I’ll aim for a healthier recipe next time. Lightly butter a ceramic baking dish approximately 20 cm x 30 cm (or one with a similar area). Spread the rest of the butter thinly over the top surface of each slice of panettone and arrange in a single layer in the dish but with each slice overlapping the next (as above). If you want it to look prettier then you can cut the panettone slices into smaller pieces but I don’t bother. Whisk together the eggs, milk, cream and, if you have a sweet tooth, the caster sugar. Pour this over the top of the panettone slices, cover with cling film and leave in the fridge for at least an hour for the bread to soak up the custard mixture. When you are ready to cook, remove the cling film and sprinkle over some demerara sugar and a good grating of nutmeg. 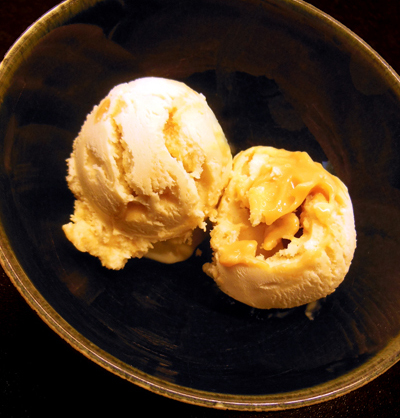 Place in an oven preheated to 180oC for 45 minutes – one hour (or until the custard is set – you can test this with a knife in the middle and if it comes out clean then it’s done – and the top is a deep golden brown). Mine took 55 minutes. Let it stand for 10 minutes (if you can wait that long) before serving. Serve with pouring cream if you like but I think it is perfect just for itself. It tastes so much better than it looks. I’m a total Grinch when it comes to Halloween. 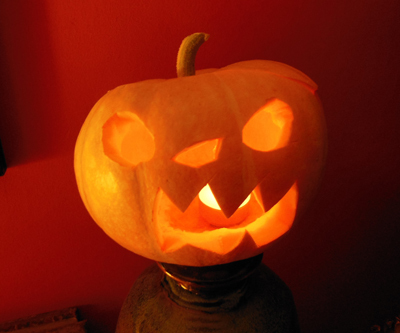 I will carve a pumpkin (if pushed) but I was bought up to believe that ‘trick or treating’ is evil and the rest of the hype (a whole aisle of flammable costumes in Tesco for example) just makes me want to find a dark hole to climb into. We do grow pumpkins because they are easy to grow at a time when not much else is happening on the allotment, but this year they were small and not great for carving. The upside was that they tasted amazing – the flesh was sweet and fresh, almost melon-like. My children happily gobbled it up raw. 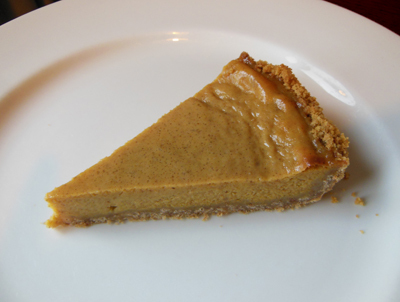 With these delicious insides I decided to try making a pumpkin pie. I never liked it as a child but I thought I’d give it another go. So I googled for a recipe and this is an amalgamation of those that used ingredients I already had in my cupboard. I stole the idea of a biscuit base from Good Food online (because I’m rubbish at pastry). Most recipes seemed to use evaporated milk but I only had condensed, so I found one that used that instead. 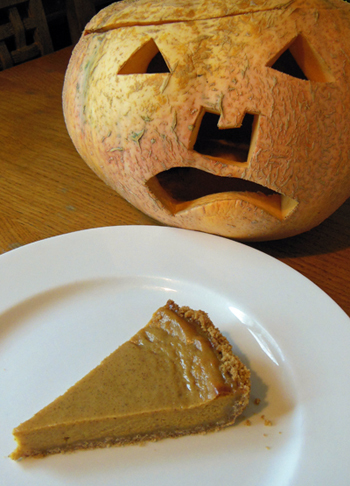 The result was a pumpkin pie that was perfectly edible – rather like an egg custard tart with pizazz. Ben said it tasted Christmassy (that will be the cloves) so I might freeze some of the pumpkin puree and make this over Christmas. Anyway, I know that I’ve missed the boat in posting this recipe now that Halloween (and Bonfire Night for that matter) have passed, but I wanted to record what I did ready for next year. To make the pumpkin puree, first cut a medium pumpkin (or two small ones) into large wedges and remove the seeds with a spoon but don’t peel. Put the wedges into a large baking tray, cover with foil and roast in the oven for 1 hour at 180oC (the pumpkin flesh should be soft and you can test this with a skewer, if it goes through with no resistance then it’s done). Leave to cool and then scoop out the flesh from the skin and puree in a food processor. This will probably make more than the quantity required for this recipe. For the base, smash up the biscuits either with a rolling pin in a plastic bag (my preferred method), or in a food processor. Add the melted butter and mix until well combined. 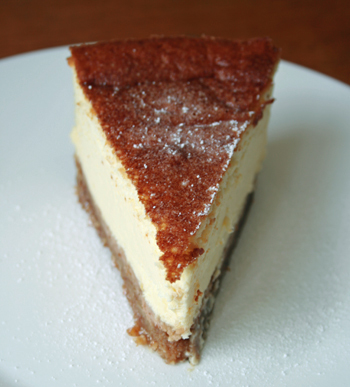 Tip into a 23cm, loose-bottomed tart tin. Use the back of a spoon to spread the mixture evenly over the base and up the sides of the tin. Put in the fridge and chill for at least half an hour. Preheat your oven to 17oC. Mix all the ingredients for the filling together until smooth. Remove the crust from the fridge and place on a baking tray in the middle of the oven. Pull out the shelf and carefully fill with the pumpkin mixture, pouring it right to the top. Try not to slosh the filling over the sides as you push the shelf back in. Bake for 40 minutes until set. Cool in the tin to room temperature then chill completely in the fridge. If you think sugar and salt are evil then turn away now. 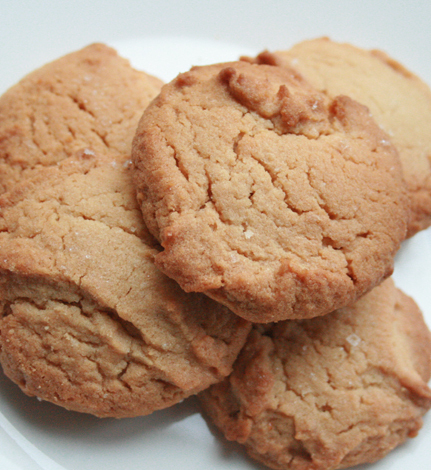 These cookies have both in abundance but they are absolutely delicious. And I do apologise to anyone on a diet because there has been a bias towards sweet recipes on this blog in recent weeks. Believe it or not I do have some health food blogger followers, because I do occasionally post a recipe with kale in it. Anyway, talking of sweet treats, hands up if you knew it was National Dessert Day on Wednesday. I didn’t until the University of Nottingham tweeted about it like it was something real that should be taken in all seriousness. In a household where we nearly always have pudding, I struggle with the concept of ‘National Dessert Day’. Does it mean that you can only have dessert on that day, or does it mean you should have double the amount of dessert? Either way, for me, these national/international days of whatever some marketing bod fancies are a load of old tripe (but then this is coming from someone who doesn’t do Mother’s Day, Father’s Day or Valentine’s Day). But let’s give a big cheer for pudding (or dessert if you must) because it makes life worth living. And if you’re NOT on a diet then do try these cookies. I challenge you to only eat one. Heat your oven to 170oC and line two baking sheets with baking parchment. Cream the butter and sugars until smooth and fluffy (in an electric mixer with a paddle attachment, with an electric hand mixer or by hand with a wooden spoon). Add the peanut butter and egg, and mix. Add the flour and salt and mix until well combined. Put heaped teaspoons of dough onto the baking sheets. The original recipe uses a cookie scoop but I’ve never heard of one of these. The cookies will not spread much when they bake so they can be placed quite close together, but leave room for air circulation so they can brown. In a small bowl, mix one teaspoon of Maldon sea salt (or other flaky sea salt) and one of granulated sugar. Sprinkle each cookie lightly with this mixture. Bake for 12-15 minutes, until the cookies are golden brown. Carefully lift the cookies off the baking sheets with a palette knife and cool on wire racks. Try not to eat too many in one go. Our gooseberry bushes at the allotment have done really well this year so I earmarked this recipe to try and use them up and asked my daughter Elizabeth (aged 5) to pick the fruit. I have vivid memories of being sent into my granny’s garden at a similar age to pick gooseberries. Now, if you have ever picked them yourself you will know that they are very thorny. It’s a painful pursuit but as a child I didn’t wear gloves and despite getting prickled and scratched I don’t remember making a fuss. Perhaps it was the thought of the gooseberry fool that we would make afterwards by mixing the stewed fruit with Bird’s instant custard that kept me going. Now Elizabeth is pretty tough but she managed to pick just five gooseberries before moaning and giving up. I let her off and picked the rest myself (albeit with gloves) wondering whether I should be a tougher parent. If you’re a regular reader of this blog you will have noticed that I’m a fan of stodgy puddings but in warm weather it’s nice to have something lighter and more summery. This Hugh Fearnley-Whittingstall dish from his ‘River Cottage everday’ book is just the ticket and it’s the best panna cotta recipe I have tried. I often find panna cotta too creamy but in Hugh’s version he adds yoghurt which gives a nice tang. First make the gooseberry sauce. Wash and top and tail the gooseberries, then put them in a saucepan with the sugar. Cook on a medium heat for about 5 minutes until they are soft. Hugh keeps his sauce lumpy which you can do if you like but I personally don’t like the texture of the pips so I whizz the mixture in a food processor then pass through a sieve so that you have a nice smooth sauce. Set aside. For the panna cotta, first soak the gelatine leaves in cold water for 5-10 minutes until floppy. While the leaves are soaking, in a saucepan combine the milk, cream, sugar and elderflower cordial and bring the liquid just to the boil (Hugh calls this scalding). Squeeze the water out of the gelatine leaves, then add to the hot creamy mixture and stir until they have dissolved. Leave the mixture to cool at room temperature, stirring from time to time. Once cool add the yoghurt and stir until well combined. Pour the mixture into ramekins or small jelly moulds and chill in the fridge until set (about 4 hours). When you are ready to serve, dip each mould in warm water for a couple of seconds and then turn out onto a serving plate (as you can see from the photograph above mine were left in the water just a little too long which is why some of the outer mixture has melted into the gooseberry sauce). Serve with a spoonful of gooseberry sauce and if you want to be poncy (like me) some wild strawberries. 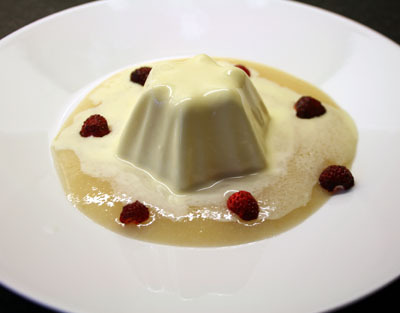 If you don’t like gooseberries then you can serve these panna cotta with any fruit sauce. Strawberry, raspberry, blackberry, plum all work brilliantly. You can also leave out the elderflower and add a few drops of real vanilla essence instead (you will need to add an additional 10g of sugar to the milk at the start though). I made elderflower cordial for the first time this year because it’s really expensive to buy in the shops and we have an elder tree overhanging our allotment. It was super easy and here’s how I did it. Measure out 900g of caster sugar in a bowl and pour over 1.7 litres of boiling water. Stir to dissolve the sugar and leave to cool. Add about 30 elderflower heads and 50g of citric acid (which I bought in my local chemist for 99p). Leave in a cool place for 24 hours, stirring from time to time. Strain through some muslin and transfer to sterilised bottles. Keep in the fridge until ready to use. You can dilute it with tap water, sparkling water or champagne!